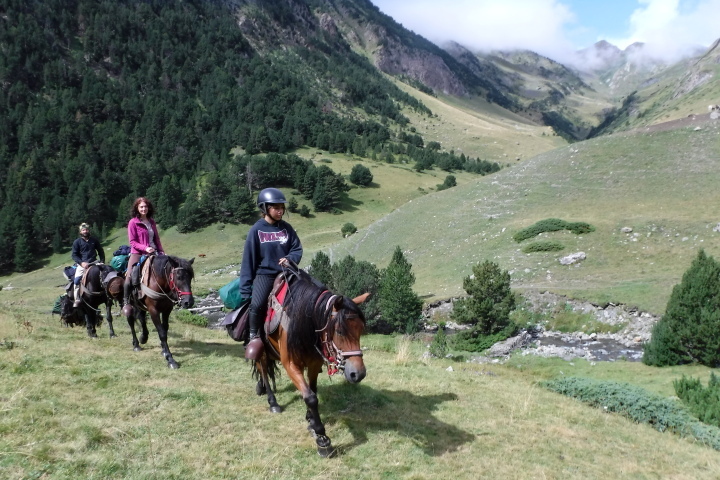 In the course of this 5 day cross-border horse riding holiday (max 8 people) you’ll experience the most authentic aspects of the beautiful French and Spanish Pyrenees. 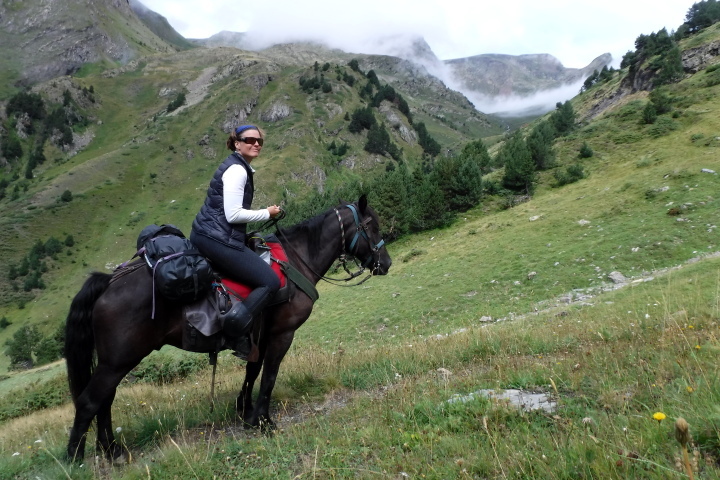 You’ll ride from the French Ariege Pyrenees up and over a high mountain col to the beautiful Catalunyan landscape of the Spanish Pyrenees. 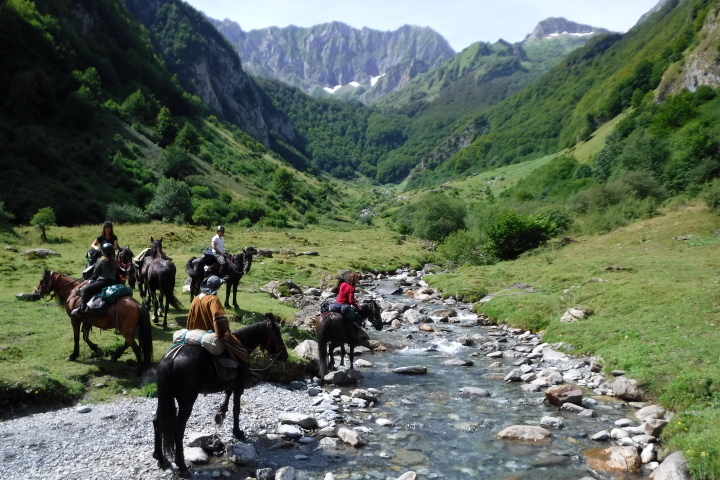 Unspoilt and wild Nature, off the beaten track mountain paths, hidden valleys, high mountain cols, mystical forests, wide open spaces, beautiful rivers, tiny hamlets that have remained unchanged for centuries, living traditions and welcoming people… it’s all there! 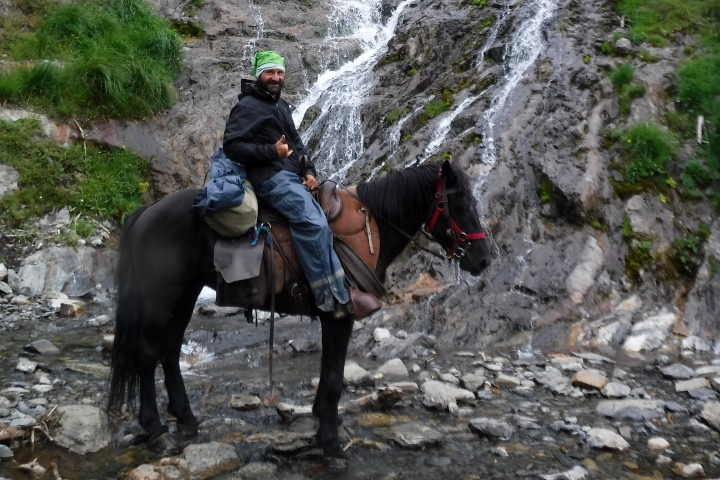 This horse riding holiday will give you a deep freedom of spirit and connection with mountain life that you will struggle to experience elsewhere. 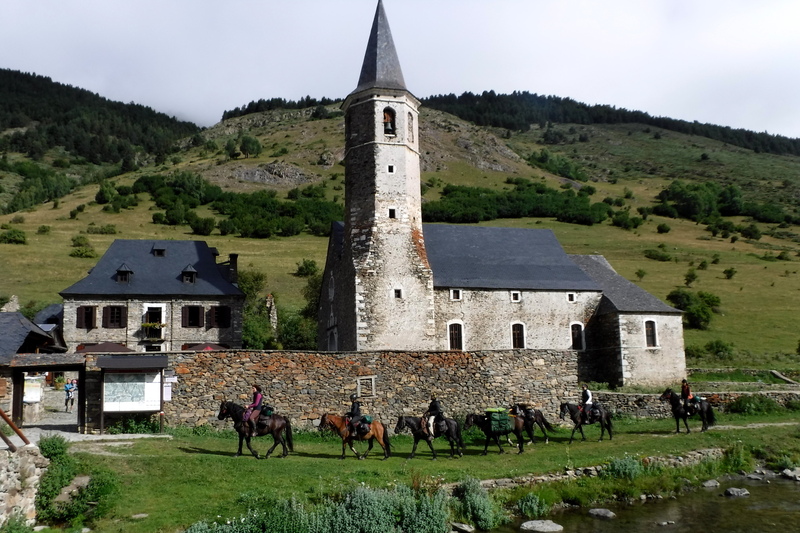 Your mount for the trek is a Merens breed of horse, native to this part of the Pyrenees. Sure-footed and exceptionally good-natured, you will quickly form a deep bond with these hard-working and endearing animals. You can expect to be in the saddle for up to 6 hours each day so riding fitness is important. However, there is nothing technical about the trek. 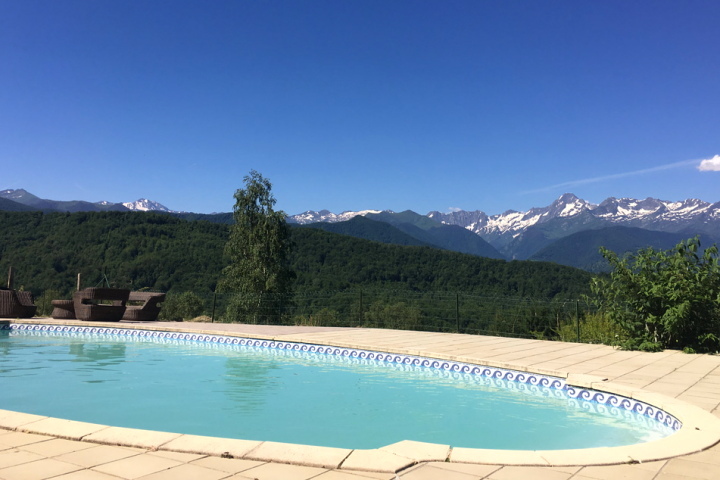 You’ll spend the first and last nights in a comfortable 3* hotel with swimming pool in the Ariege town of Saint Girons on a half board basis. The food at the adjoining auberge is absolutely exceptional! 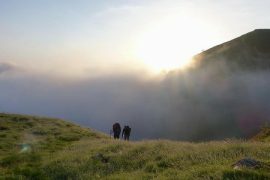 During your trek you’ll stay mainly in basic hostel type accommodation in shared bunk-style rooms. In most, hot showers are available but in the mountain refuge, the biggest luxury is the WCs! The food at all of the overnights is good home-cooked fayre using locally sourced seasonal produce. You’ll arrive at your hotel in Saint Girons where you’ll enjoy a delicious meal of local specialities before retiring to bed for a comfortable nights sleep. 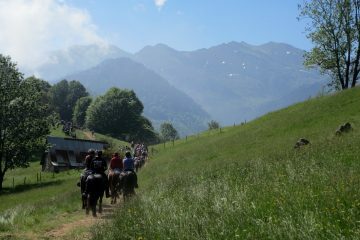 You’ll be collected from the hotel and taken up to the equestrian centre which is located in the picturesque Massat valley. There, you’ll meet your guide and, more importantly, your mount for your trek. 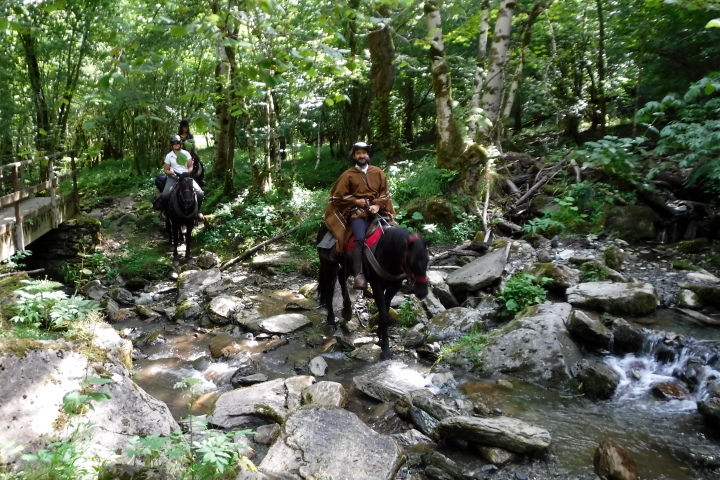 Once you’re all saddled up and ready to go you’ll head west on old mule paths that have been used for centuries to transport goods throughout the high valleys. They’ll lead you to the Col de la Crouzette and then on to Moncaut at 1500m alt from where the riding will initially be on forest tracks. 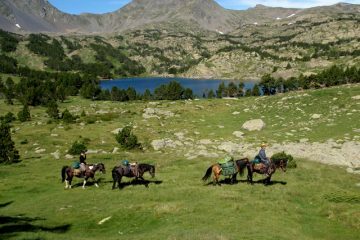 Throughout the day you’ll enjoy breathtaking views of the high mountains bordering Spain. You’ll pass through charming little mountain villages until you reach Ardichen where you’ll spend the night at 800m alt. You’re sure to appreciate the swimming pool after a long day in the saddle and the home-cooked dinner will fill your hungry tummy. Absorb the authentic feel of the tiny farming communities that you’ll pass through as you descend down to the river Arac in the valley below. 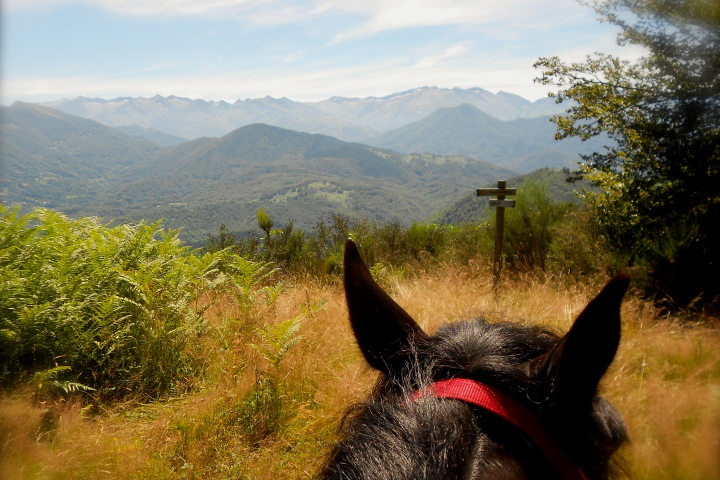 From there, you’ll ride on small paths up to the Serre de Rapheu where you’ll follow the ridgeline to reach the Salat valley from where you have great views towards Mont Valier, the highest peak in the Ariege Pyrenees. 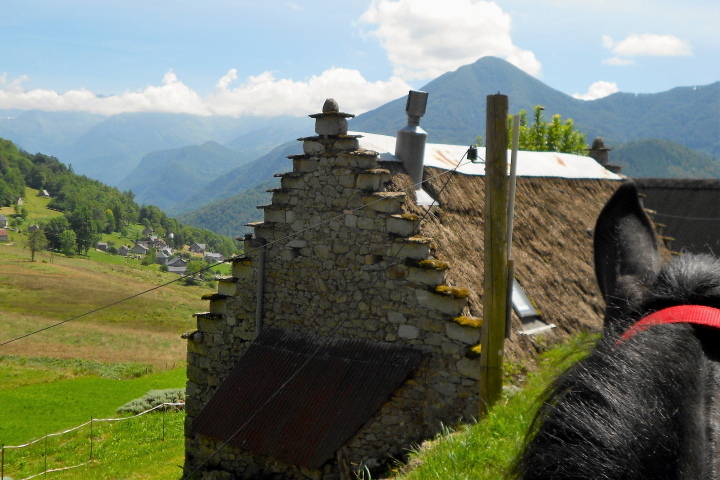 You’ll pass through the pastoral village of Haurac to reach the Col de l’Artigue from where a track takes you to la Riole et Escalirous. 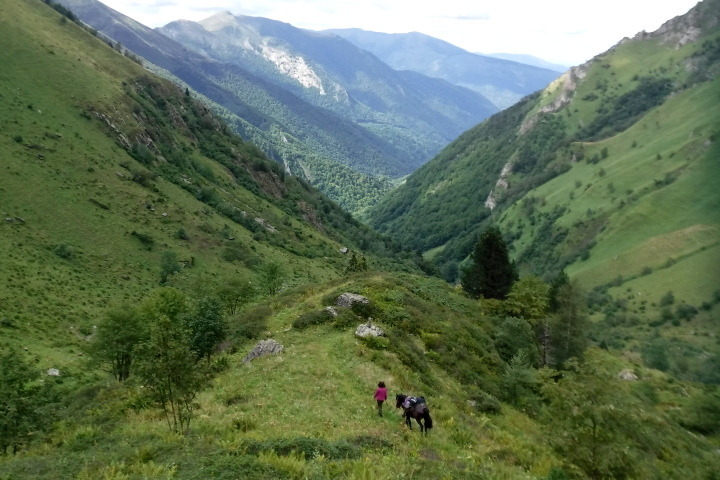 A final push down to the Esbintz valley and a path through pretty shaded woodland to reach your overnight in the hamlet of Aunac. Tonights accommodation is in a dormitory with 7 individual beds. Food is traditional, hearty, home-cooked fayre using organic vegetables from the owner’s potager. 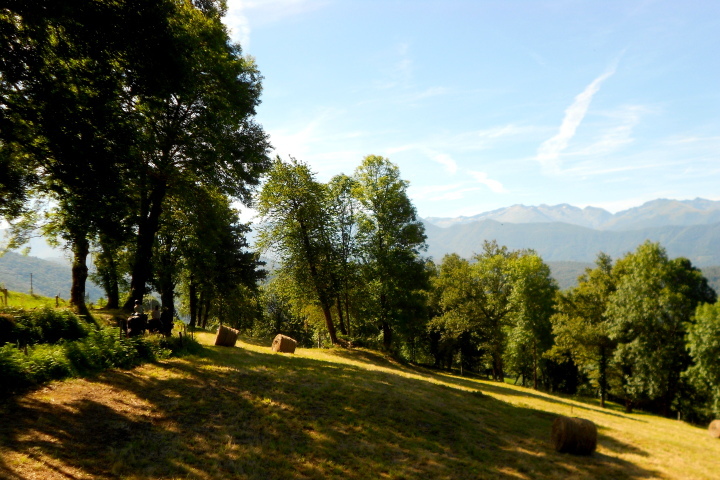 But first you’ll pass through ancient woodland and the Mont Valier nature reserve, an unspoilt environment with some unique flora and fauna. Keep your eyes peeled for vultures and eagles as well as chamois and marmots along the way. You’ll ride alongside a beautiful river and eventually reach the Arcouzan waterfall with its 60m high torrent of water. The refuge has 5 bedrooms, each with between 2 and 4 beds each. There are 3 WC which are shared between the rooms but there’s no shower. Fancy a freshen up? Pop to the lake for a dip! 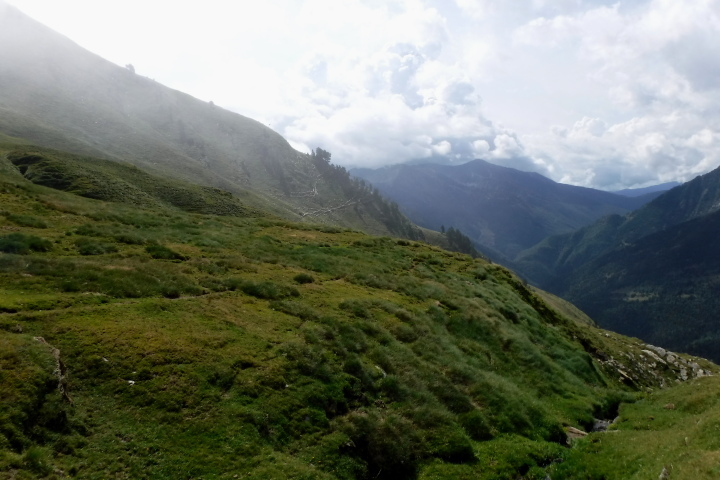 Your route will initially follow a track that passes through the high mountain pastures to reach the Port d’Aula at 2260m alt. 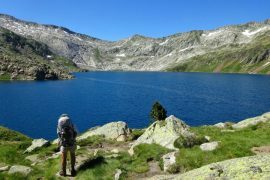 You are now on the south-facing side of the Pyrenees mountain chain and will descend in the direction of the Noguera Pallersa valley. Time for a break and some lunch alongside the river. In the afternoon you’ll head in a westerly direction on a track which passes through forests before eerging to pick up indistinct paths trodden by livestock. Accommodation is in shared rooms with bunk beds and hot showers are available. You’ll appreciate the superb home-cooked evening meal and a drink in the bar with your fellow riders afterwards. After your brief foray into the Spanish Pyrenees it’s time to return back to the French side of the mountains via the Port d’Orle at 2320m alt. A superb panoramic view awaits you here, right through to the Aigues Tortes Natural Park and the 3000m peaks, so make sure your phone or camera batteries are fully charged! 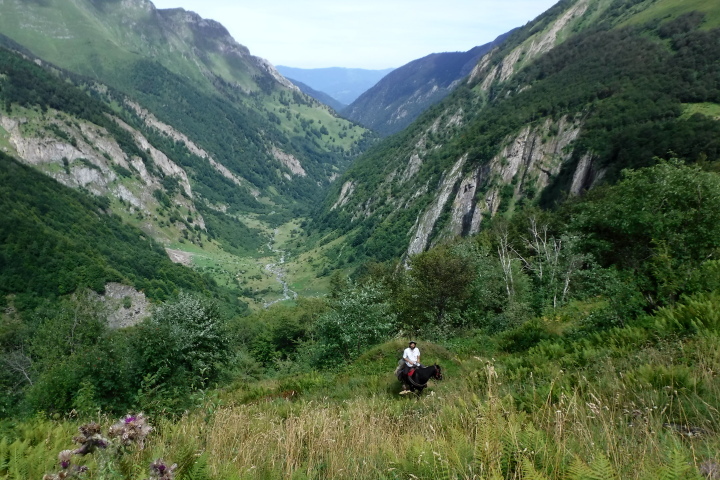 There follows a fairly lengthy rocky section where you’ll need to lead your horse on foot before you reach more pastures and eventually along your final destination of Bonac. Here, it’s time to say goodbye to your trusty steed. Transfer to Saint Girons where you’ll spend the night before a transfer to the airport next day for your flight home.